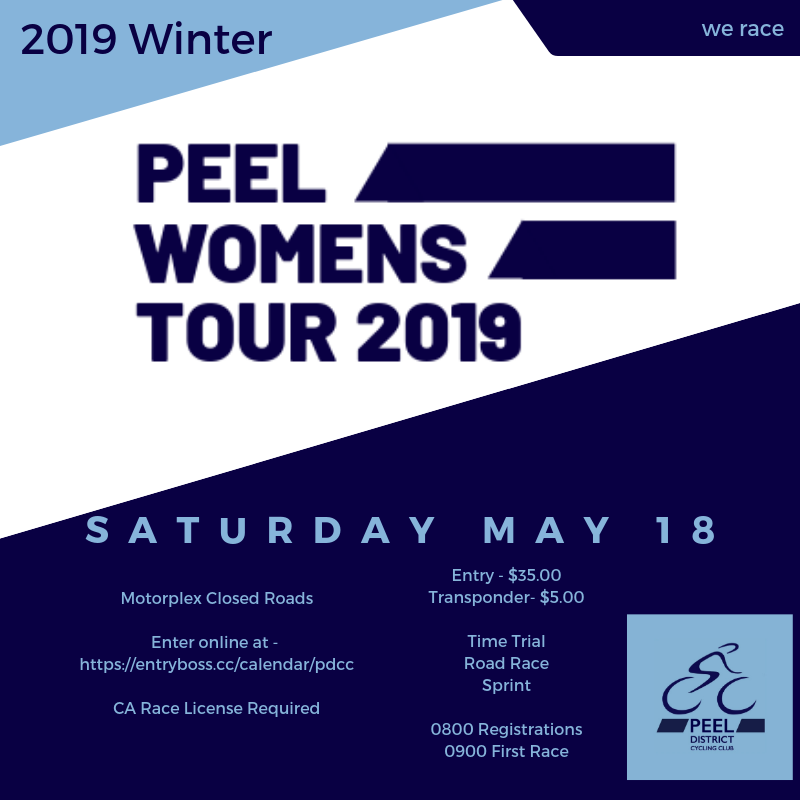 The Peel Womens Tour is back for 2019 on Saturday May 18. PDCC is very proud to again conduct this event that has grown over the last number of years. The PWT is proving to be a great test of competitors ability over a number of disciplines. Held at the Perth Motorplex facility which offers a very safe, closed road environment, the PWT comprises of a Road Race, Individual Time Trial and a Sprint race. All grades from A to D compete in each event over the course of the day. Points are awarded for the position in each event to determine the overall winner. With all events held on the same day, the event rewards those competitors with a complete skill set that can compete in each discipline. Prizes are given to 1st, 2nd and 3rd in each grade, with the coveted PWT Winners Jersey presented to each grade winner. To compete in the PWT, participants will require a Cycling Australia race license. The new Week Race, or Race Starter Kit license will be accepted. Visit the Cycling Australia membership site for more details. You could also see our earlier post on membership options here. To enable those new to the sport to be able to refine their skills prior to the main event, PDCC is offering training sessions being held at the Perth Motorplex on April 14 and May 4 at 1030 am. The club would encourage all women interested in the sport to attend these sessions. The skills sessions will focus on bike handling and bunch riding skills, held in a friendly non competitive environment. All you need essentially is a working, safe bicycle and a helmet, no race license is required to attend this training session. To register for the Training Sessions, or the Peel Womens Tour, go to our series listing on EntryBoss and select the events you would like to enter. Training session are only $5.00 each, and the PWT is $35.00 (+$5 for a transponder) for all day racing. We look forward to seeing you all out there.